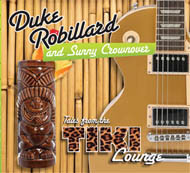 This CD was conceived as a tribute to Les Paul and Mary Ford but also encompasses the concept of "Lounge" and "Bachelor Pad" music by mixing multi-layered guitar tracks with swinging acoustic bass and adding bongos, congas and other percussion around the sweet and sultry vocals of Sunny Crownover for a decidedly exotic effect. From blues to standards,vintage tunes from movies to South American pop from the 40s and 50s, this eclectic package is pure ear candy. It was, for the most part, recorded by Duke himself over the past year with respect for Les Paul's groundbreaking recordings of the early 50s with Mary Ford. Although the song styles vary, the underlying consistency of Duke orchestral approach to his guitar tracks and the wonderfully warm vocals of Sunny Crownover make for a aural trip to another time and place. Check out the sound clips of each track here and see for yourself! 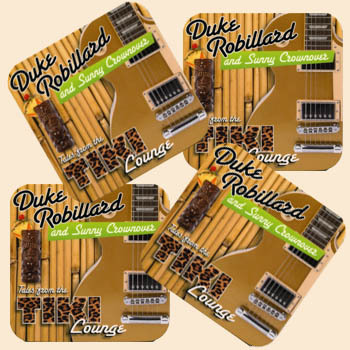 Super cool "Tales from the Tiki Lounge" coasters now available! High quality rubber material with a washable surface beautifully printed CD cover graphics. Make a set of as many as you need at $2.50 per coaster. Makes a great gift to accompany the CD! collect them all! Please specify how many coasters you want.